Health officials promise to expand syringe exchanges, but will it happen? CINCINNATI -- Public health leaders are promising to do more this year to stem the concerning spikes in HIV and hepatitis C rates they say has been driven largely by the opioid epidemic. Officials in Hamilton and Clermont counties are considering at least three new syringe exchange sites as they work to bolster the newly formed Exchange Project. More details about the program are expected to be unveiled Friday during a morning event planned at Hamilton County Public Health, which is helping lead the effort. Health officials say syringe exchange programs -- which give IV drug users clean needles and offer onsite testing -- are critical and proven to decrease the spread of life-threatening and costly infectious diseases. But in some parts of the region, similar programs have received considerable pushback. Opponents argue the services enable illegal behavior by providing tools to use drugs. Hamilton County saw a 34 percent spike in new HIV cases last year, with 184 newly diagnosed cases. Northern Kentucky logged 37 new cases in 2017 . Officials with the Exchange Project say they're working to add locations in Hamilton County's east and west sides in the coming months. Work is also under way to add a site at Mercy Health's Clermont Hospital. "We're very committed to expanding this work because it's our best chance to mitigate the spread of HIV and Hep C," said Tim Ingram, Hamilton County's Health commissioner. 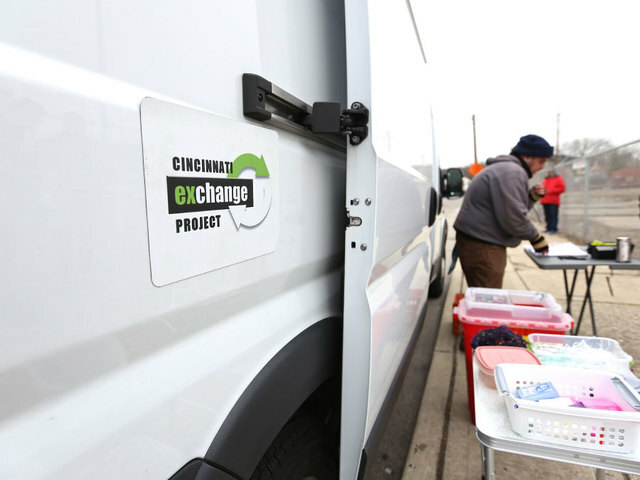 The Cincinnati Needle Exchange van parked in Northside on Tuesday, March 14, 2017. The project, which already hosts syringe and testing services in Corryville, Mt. Auburn, Northside and Middletown, is an extension of the Cincinnati Exchange Program. That operation launched in 2014 with grant funding awarded to UC and had been mostly run by volunteers. Local health officials spent much of 2017 collaborating on how to shift the Cincinnati Exchange into the mix of public health programs offered by Hamilton County and Cincinnati's health departments. Doing so, leaders say, has helped insure a steady stream of funding, with up to $400,000 committed this year across the four groups supporting the program. "This will really allow us to bring more structure, consistency and reliability to the program," said Ingram. Much of the initial funding has gone to purchase a new medical van -- the main tool that services each of the exchange locations. Shifting of the program has also meant reworking operations hours from mostly evening to morning and afternoon timeframes. Additionally, a Walnut Hills location was moved it to the Hamilton Public Health's offices in Corryville. The shift in hours, Ingram said, will be temporary. But the Corryville site will remain permanent. For now, no timeline has been set for when the expanded sites might open. But Ingram said the Exchange project team is already having conversations with additional community partners interested in hosting a site. “It’s crucial that we put all the resources we have available to us in public health toward getting in front of this disease by providing testing services, clean equipment and most important, referral to treatment for those fighting the disease of addiction," Ingram said.